Members of the Ogcocephalidae family, batﬁsh are mostly small fish comprising nearly 60 similar species. These peculiar-looking ﬁsh employ the energy-saving tactic of luring, instead of hunting for, their food. This method is valuable in deep-sea environments, where food is scarce and thinly distributed. The head and the trunk of the batfish are broad and ﬂattened, having either a disk or a triangular shape, and its body is covered with broad spines. The long pectoral and rodlike pelvic fins enable the batﬁsh to “walk” on the sea bottom. There is a protuberance, the rostrum, on the front of the head between the eyes, which can be long or short. Under the rostrum hangs a small tentacle that acts like a lure. The mouth is small but capable of opening broadly. Batfish are usually heavily armored by bony tubercles and hairlike cirri, with the exception of the gill opening on the pectoral fin. Coloration varies among individual species; for example, pancake batﬁsh (Halieutichthys aculeatus) are yellowish with a net design, whereas polka-dot batfish (Ogcocephalus radiatus) are yellowy white with small black dots. Most are camouflaged according to their surroundings. Batfish can be distinguished from gooseﬁsh and frogﬁsh by the reduced ﬁns on their heads. Batﬁsh can be between 2 and 20 inches long, but the average length is 7 inches. Batﬁsh partly hide by covering themselves in sand or mud during the day, and they swim at night. Mostly feeding on polychaete worms and crustaceans, batﬁsh also eat other ﬁsh. Prey are attracted by the vibrations of the batﬁsh’s lure; if a smaller ﬁsh swims close enough, the batﬁsh explodes from its hiding spot and engulfs the prey. Batﬁsh reportedly produce scented secretions that entice prey with their odor. Batﬁsh are capable of swallowing ﬁsh nearly as large as themselves by suddenly opening their mouths very wide, creating a suction effect. Most common in the Gulf of Mexico and southern Florida, batﬁsh inhabit waters from North Carolina to Brazil. They are also found in Jamaica. 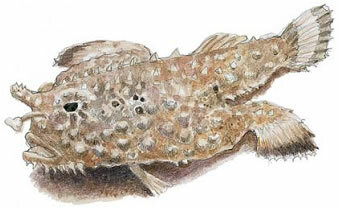 In warm Atlantic and Caribbean waters, it is most common to see the longnose batﬁsh (Ogcocephalus vespertilio), which is often camouﬂaged in the sand by its warty, brownish body. Most batﬁsh are found along reefs, dwelling anywhere from the water’s edge out as far as 1,500 feet. Some species prefer shallower water, but most batﬁsh remain in deeper waters between 200 and 1,000 feet. Shallow-water species frequent clear water, mostly in rocky areas or around the bases of reefs; deep-water species prefer more open muddy, or clay bottoms.